« Can Hedging Save Cyprus? Public attention is focused on the disastrous trades at JP Morgan’s Chief Investment Office, aka the London Whale’s trades. JP Morgan’s management claims the trades were a hedge of its loan portfolio. Others argue the trades were a classic example of proprietary trading, a speculative bet quite the opposite of hedging. The debate matters because it speaks to whether this type of operation will be legal in the future when the Volcker Rule, passed as a part of the Dodd-Frank financial reform, goes into effect. Moreover, understanding how to distinguish between hedging and speculation is very important for all companies. Claims and counterclaims. Will we ever be able to settle it? Yes, we can. Whether some derivative trades are a hedge is something that can be measured. Either the trades offset the risk in another line of business, or they don’t. That’s measurable. It may not be simple to measure, and there may be plenty of room for arguments on the details. But that caveat applies to lots of things that are measurable. 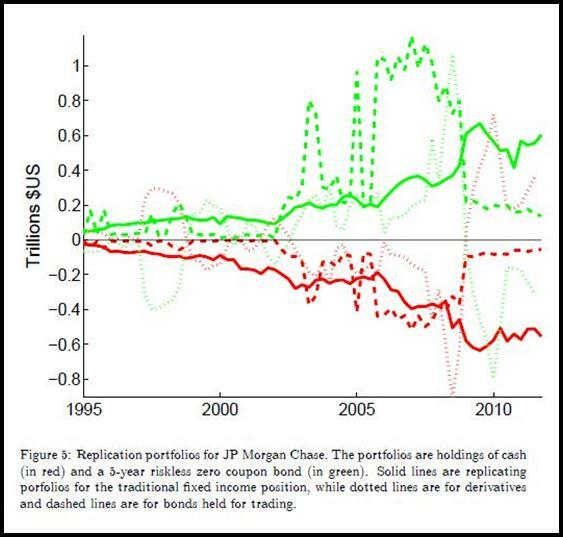 The figure above compares the risk on JP Morgan’s derivatives portfolio over the years against the risk on JP Morgan’s traditional deposit taking and lending line of business. What we see does not look like hedging. Quite often the derivatives risk adds to the risk from the traditional deposit taking and lending line of business. That’s not hedging. The erratic nature of the dotted lines is especially interesting. It is emblematic of proprietary trading. Sometimes the company has a ‘view’ or forecast that rates are going to move one direction. So it opens up a derivatives position to profit from that movement. Other times the company has the other ‘view’ or forecast, anticipating that rates are going to move in another direction. Then it opens up the opposite derivatives position to profit from that movement. Hedging doesn’t look like that, but prop trading does. This is exactly the type of quantitative evidence that can settle the claims and counterclaims. Both hedging and prop trading possess ‘fingerprints’ betraying their presence. 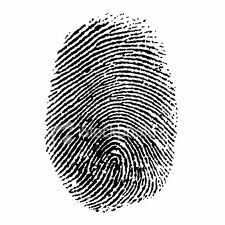 And the fingerprints are different. Instead of endless bickering back and forth, we should turn to the data. I first saw the figure earlier this week in a seminar in which Monika Piazzesi of Stanford University presented her research on “Banks’ Risk Exposures.” It’s very interesting work. Here’s a little more background on how to read the figure. There are 3 sets of lines showing JP Morgan’s interest rate risk exposure on 3 different parts of its operations: (i) the traditional deposit taking and lending business, (ii) the securities trading portfolio, and (iii) the derivatives portfolio. Each of these parts of its operations is exposed to movements in interest rates and credit spreads that produce gains or losses for the business. These exposures can be made comparable a number of different ways. These authors choose to translate each line of business into its equivalent portfolio of a pair of benchmark securities. For example, the solid green and red lines show the exposure on its traditional deposit and lending business. The red line is the position in cash and the green line is the position in a 5-year zero coupon bond. The fact that the green line sits in positive territory, while the red line sits in negative territory expresses the usual risk exposure of the traditional banking business: borrowing short maturities and lending long maturities. The dotted lines show JP Morgan’s interest rate risk exposure on its derivatives business. If the derivatives portfolio hedged the bank’s traditional deposit taking and lending business, then the red dotted line should lie in the positive territory, while the green dotted line should lie in the negative territory. That’s not what the figure shows. The dotted lines are very erratic. Often times the red dotted line is in the negative territory and the green dotted line is in the positive territory. In those times, the derivative portfolio is increasing JP Morgan’s interest rate exposure. That’s why I say the figure is not consistent with hedging. I write this post because the figure is a powerful graphic that nicely illustrates the type of quantitative analysis we should look to in order to answer the question of whether the derivative trades in JP Morgan’s CIO are a hedge or are a prop trading speculation. Having used Professor Piazzesi’s figure to illustrate that point, it is appropriate now to mention some important provisos. First, Professor Piazzesi’s and her co-authors’ work is still in progress. They are developing a tool. The results presented are both preliminary for these authors, and even more preliminary for the profession as a whole. It’s not been fully developed yet, let alone stood the test of time. And, for pedagogical purposes, the authors used an oversimplified version of their tool in order to generate the figure above. But while their work with this specific tool is preliminary, there are plenty of other tools that have been around for a long while which also measure exposure. What was novel in this paper was the authors’ ability to extract a meaningful measure using only publicly available data. And so we have a unique picture for JP Morgan. Second, I only use this figure suggestively, in order to illustrate a point about the type of evidence one should look to. Unfortunately, the publicly available data used to construct this figure is too aggregated to allow us to measure what needs to be measured. I tried to phrase the questions and conclusions at the top of the post carefully. In the words of one of my former math professors, “The theorem says what it says, and nothing more.” What we really need to know is whether a specific subset of the derivative portfolio successfully hedges the bank’s other lines of business. But the figure shows the risk exposure on the whole derivative portfolio, because the paper’s authors are working from publicly available data which only provides the aggregate position. The whole derivatives portfolio combines many different operations, including the market making that the company does. Some of the fluctuating risk on the whole portfolio may be shaped by factors driving these other operations, and not speculations in the CIO office. So we cannot firmly conclude from this figure whether the trades in the CIO are designed to hedge the traditional deposit taking and lending operations. And we cannot firmly conclude from this figure whether the trades in the CIO are prop trading. We can’t, but JP Morgan’s management can. And its supervisors ought to be able to. They have access to the disaggregated data that can answer these questions. While this figure doesn’t show us precisely what we need to see, the right figure can be constructed. This entry was written by John Parsons, posted on April 21, 2013 at 8:57 pm, filed under Dodd-Frank, hedging, measuring risk, regulation, speculation. Bookmark the permalink. Follow any comments here with the RSS feed for this post. Post a comment or leave a trackback: Trackback URL. So we agree on your main point. The original post says what you say, right there in the second proviso. I have no beef with your point. 1. JP only ‘insisted it was hedging’ with regard to its CIO division. Not its ‘derivatives portfolio’. These aren’t the same thing, and the graph you actually have is the latter not the former. 2. I don’t ‘assume’ that market making (or i would rather say, ‘non-CIO activities’) is what dominates that figure, I’m just saying it’s possible, and indeed we have no reason to believe otherwise. I notice that (at least if I understand the figure correctly) the ‘derivatives portfolio’ was ramped *way down* in size/risk/basis starting in around 2009. Does that jibe with what is known/understood about their CIO trading? Because if not, why would you look at this figure and think it reflects the fingerprints of their CIO to any material degree at all? I’m all for looking at and using all available data. I understand available data is limited. I also understand that my Volcker position is not orthodox and to someone who does favor the rule, ‘was CIO primarily hedging?’ is an interesting question. I think my main point was, ‘does their derivatives portfolio hedge the rest of the bank?’ is just not the same question. There is no earthly reason why it should or would, Volcker or no Volcker. ‘Derivatives vs non derivatives’ is not a good proxy for CIO vs rest-of-bank. A couple of thoughts in reply. 1. OK, if you reject the Volcker Rule, then you may not be interested. But, for those of us dealing with the Volcker Rule, the questions matter. Indeed, JP Morgan has insisted it was hedging and would be in compliance with the Rule. It has not defended its actions by dismissing the wisdom of the Rule as you have. My post is only pushing on their defense. 2. The aggregation to the entire derivatives portfolio is an artifact of the available public data. You are certainly right that the publicly reported financials are not very valuable for an in depth analysis the different lines of business at the big banks. That’s another issue entirely. But I wouldn’t be so nihilistic as to not even look at the numbers for the aggregated portfolio. 3. You conjecture that the exposure on the derivatives portfolio may be an feature of the market making line of business. That’s correct, it may be. At least in principle, as a logical possibility, if not an empirical likelihood. Have you actually taken a look at the figure? It’s telling you something about the dynamics of the exposure. Do those dynamics look like what comes from a market making business? Maybe. But I’ve never seen a model of a market making business that generates that exposure. Have you? Instead of debating abstract logical possibilities, we need to try to understand these lines of business and their drivers. I’m open to this pattern reflecting market making. But then we will have learned something about market making. But I’m not open to just assuming that it does without taking the numbers seriously and considering the implications and whether they make sense with the other aspects of the business that we know about. That’s too lazy.